An excellent tip by Mark Brimble on how to avoid this trap when integrating Service Bus with MABS. 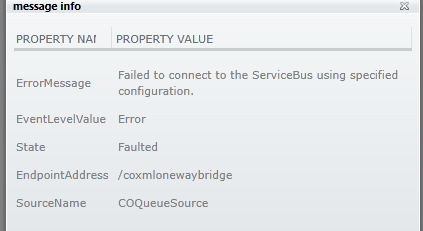 “COQueueSource deployment failed at ‘https://biztalksoa.biztalk.windows.net/default/COXmlOneWayBridge/sources/COQueueSource’. I also observed this error in the MABS tracking portal. This had worked months ago when I had followed a post by Steef-Jan Wiggers. I had followed his pattern to the letter. 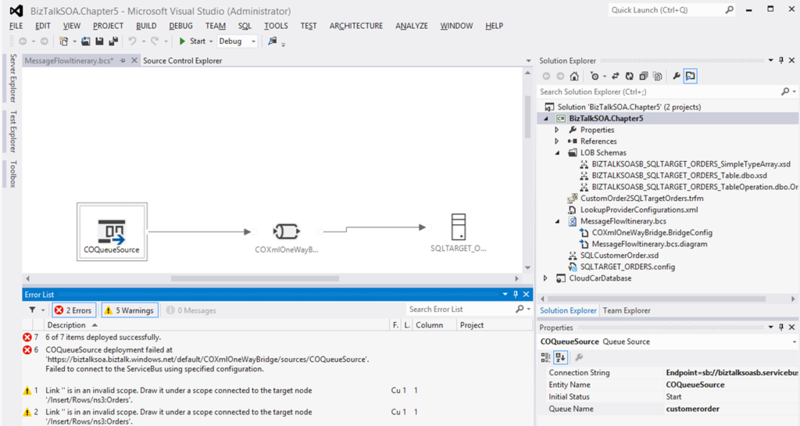 I could use the same connection string in the Service Bus Explorer to connect to the same queue without issue. 2nd Annual Global Integration Bootcamp a Success! My experiences with BizTalk related to architecture, development and performance in my enterprise. My notes about BizTalk Server 2004, 2006, 2006 R2, 2009, 2010, 2013 and now also Windows Azure BizTalk Services. Calendar of BizTalk events all over the world!